Seasoned pork sausage meat wrapped in puff pastry. Flaky Pastry. 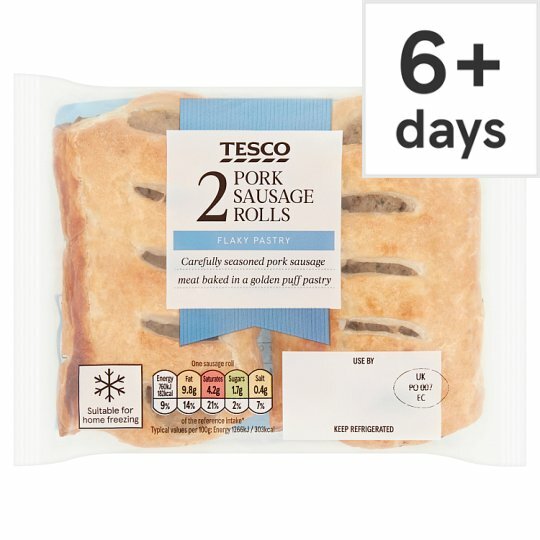 Carefully seasoned pork sausage meat baked in a golden puff pastry. Our expert bakers make our sausage rolls with layers of flaky puff pastry, which is then baked with a milk glaze for a crisp, golden finish. Pork Stock contains: Pork Extract, Pork, Water. Instructions: From chilled: 180°C/Fan 160°C/Gas 4 15-18 mins Can be eaten hot or cold. If heating, place on a baking tray in the centre of a pre-heated oven for 15-18 minutes. Instructions: From frozen: 180°C/Fan 160°C/Gas 4 20-25 mins Place on baking tray in the centre of a pre-heated oven for 20-25 minutes. Follow the preparation guidelines opposite or use immediately.